Will Everyone Actually Get Free Buffalo Wild Wings From the Super Bowl? Buffalo Wild Wings is making a big bet on this year's Super Bowl. If the February 3 game between the New England Patriots and Los Angeles Rams goes to overtime, everyone in the US is getting a free order of wings. They're not the only ones betting big. Many restaurants are offering their own version of a prop bet on the game. Hardee's, for instance, is offering a free sausage biscuit to everyone in the country if the game features a pick-six. But how likely are these freebies to come to fruition? While the Hardee's gamble doesn't seem too crazy (six of the last 12 Super Bowls have featured an interception returned for a touchdown), Buffalo Wild Wing's overtime bet is a little more unlikely. With one so recent, the odds must be good. How far back do you have to go to find the next over time? Surely not so far back that we're talking about the time Big Bad Voodoo Daddy played the halftime show. Nope. There's only been the one overtime since the country briefly got obsessed with swing and agreed to never talk about it again. How about since New Kids on the Block played the halftime show or Chubby Checker? OK. That's a bit of a mislead just to mention New Kids on the Block and Big Bad Voodoo Daddy. In the 52 previous Super Bowls there has only been one overtime. The 2017 overtime win for the Patriots is the only Super Bowl that's gone past regulation. So, the odds of you sinking your teeth into wings made all that much more delicious for being free is... slim. But who knows? Maybe the fourth quarter will end with a pick-six that sends the game to overtime and you'll be swimming in biscuits and wings. 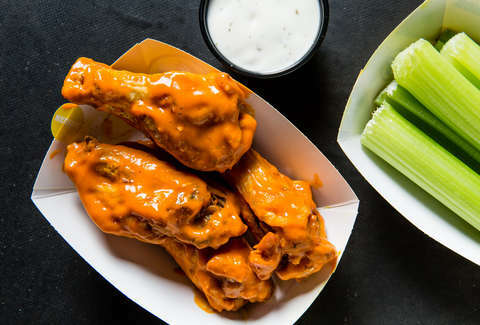 Super Bowl LIII did not go to overtime, so there will be no free wings. Dustin Nelson is a News Writer with Thrillist. Follow him @dlukenelson.